The overarching design strategy was borne of two crucial responses to site and brief: the urban response of a building ‘in-the-round’, and the holistic integration of planting; both edible and ornamental. 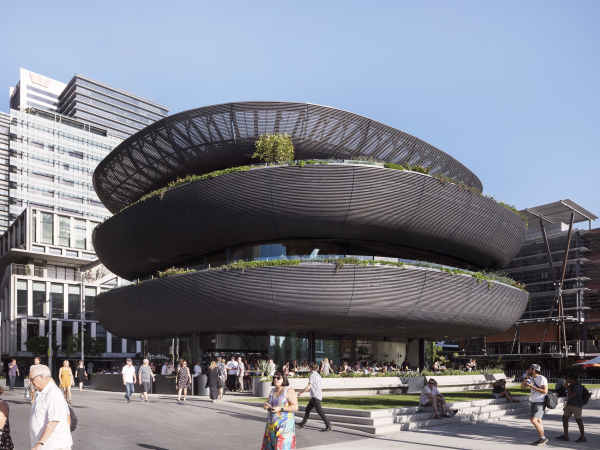 A steam-bent charred timber façade gently curves in 3 dimensions, concealing a continuous ring of edible plants and generating a strong visual identity for the building, while the perimeter balconies cantilever the dining spaces outward, resulting in a uniquely outdoor atmosphere on each level. From early design investigations, we sought to propose a building which spoke of the nature of the program, as well as the uniqueness of the site, while resetting the limits of how a hospitality venue can act. The ambition of the project is the creation of a welcoming, timeless, convivial structure, that over time becomes a much loved part of the city. 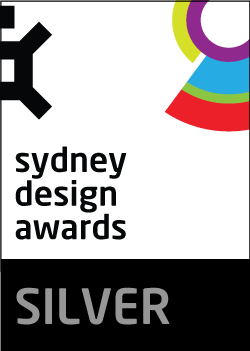 Barangaroo house is the outcome of design excellence competition organised by Lendlease and the Barangaroo Delivery Authority. 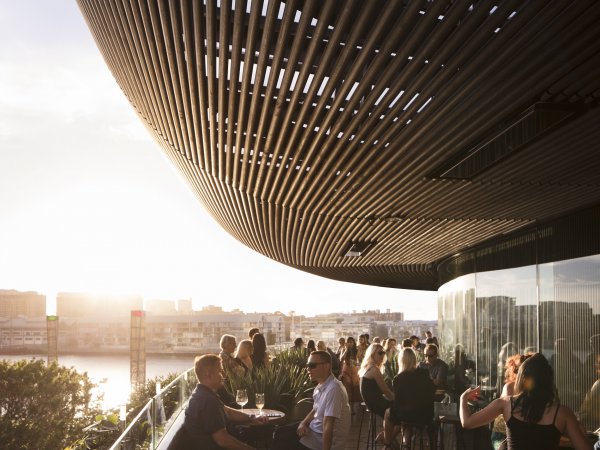 Framed by an ambitious brief to redefine Australian hospitality design, the competition brief described the creation of a new free-standing three story building, to be designed to suit the needs of a major hospitality venue. 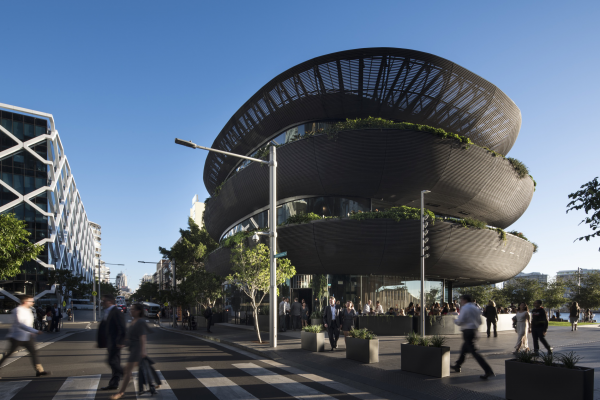 Due to its positioning at the southwestern corner of the Barangaroo South precinct, the project called for a building which would mark the southern entry point to one of the largest urban regeneration projects in Sydney for a generation. 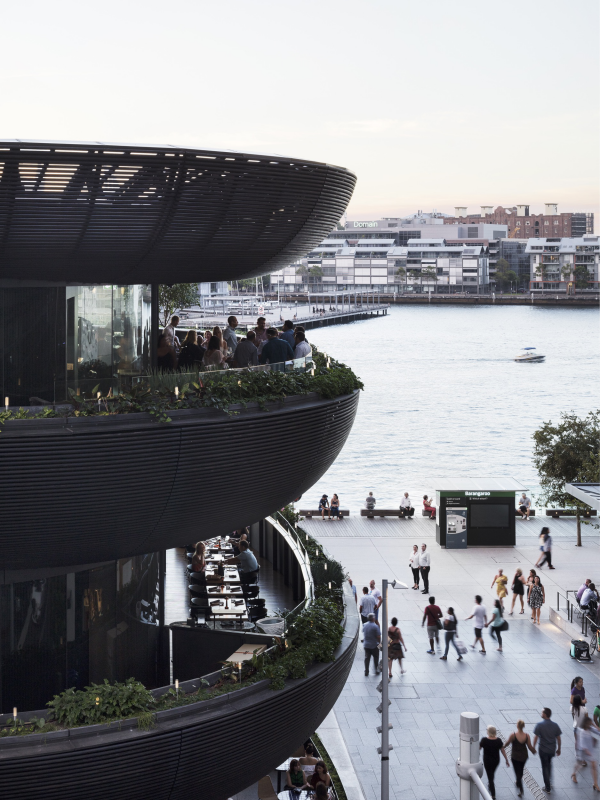 The 750 sqm site of Barangaroo House formed a fundamental component of the brief. With 4 street frontages - 3 pedestrian, and one vehicular, the unique site instructed the urban design strategy of rounding the building form - resulting in a continuous ribbon of facade, rather than 4 distinct street frontages. Our competition winning scheme ultimately defined the project brief with two overarching design strategies: the urban response of a building ‘in-the-round’, and the holistic integration of planting. 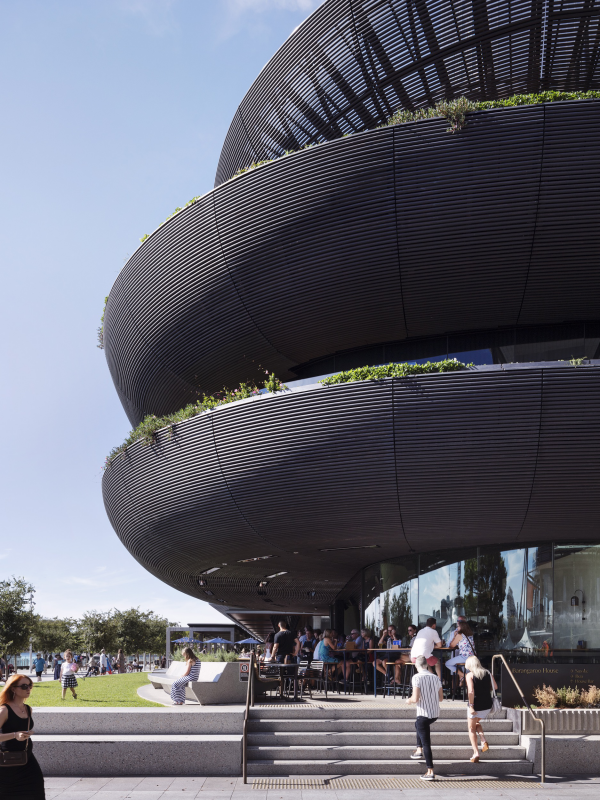 The multi-tier building is designed to house three distinct food offerings, united by the building’s strong visual identity, and culinary narrative of chef & restauranteur - Matt Moran. 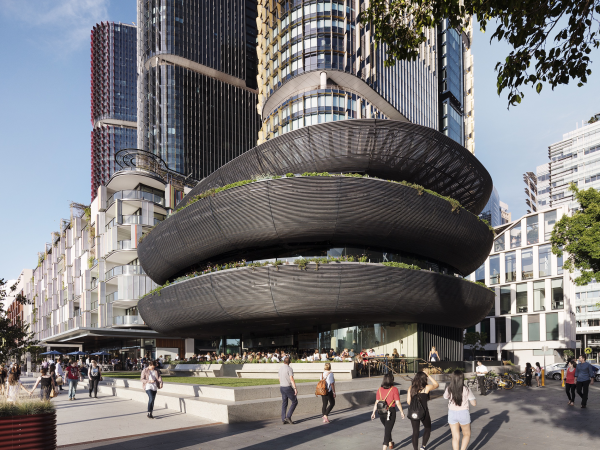 Due to its ambitious brief, and bold formal outcome, Barangaroo House drove innovation and testing at every scale - from the urban response to detail resolution, and material selection. The key urban design agenda of a ‘building in the round’ dictated the curvilinear form, which projects curved perimeter balconies outward in each direction. Structural cantilevers up to 8.5m permit a uniquely outdoor atmosphere to a series of dining spaces on each level of the multi-tiered building. The structural cantilevers required a complex and innovative concrete waffle slab design, with several layers of post-tensioning, interwoven much like a cable-knit jumper, to allow two-dimensional spans, distributing load back to the raking structural columns, and permitting a free open floor plan for future flexibility. 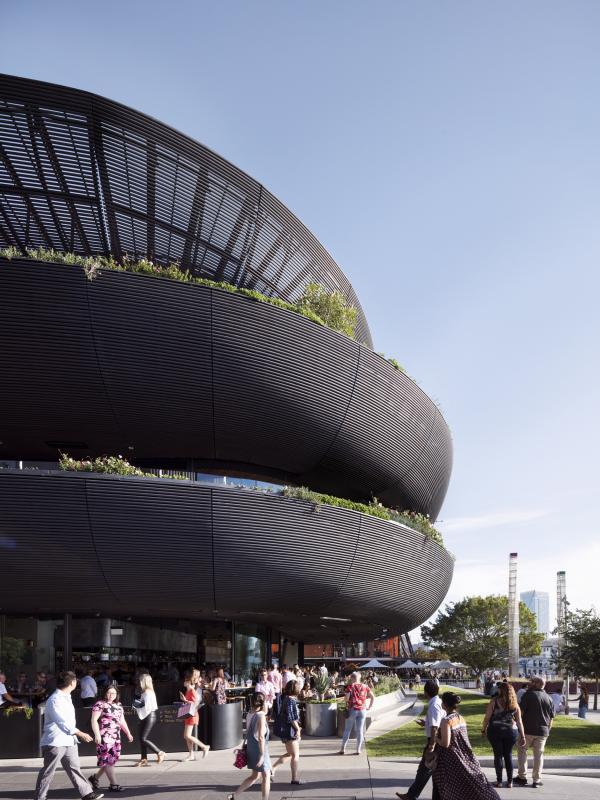 Innovation in detailing was driven by the vision for a steam-bent charred timber facade, which would reference the primeval act of cooking, while generating a strong visual identity for the building, and aesthetically support the urban strategy of a ‘building in the round’. Prototypes were prepared to refine the concealed dowel fixings, steam bending methodology, and openable windbreaks. Prototyping extended to material innovation as well, with the development of specialised charring equipment, testing custom-laminated glazing products., and patina metal treatments. 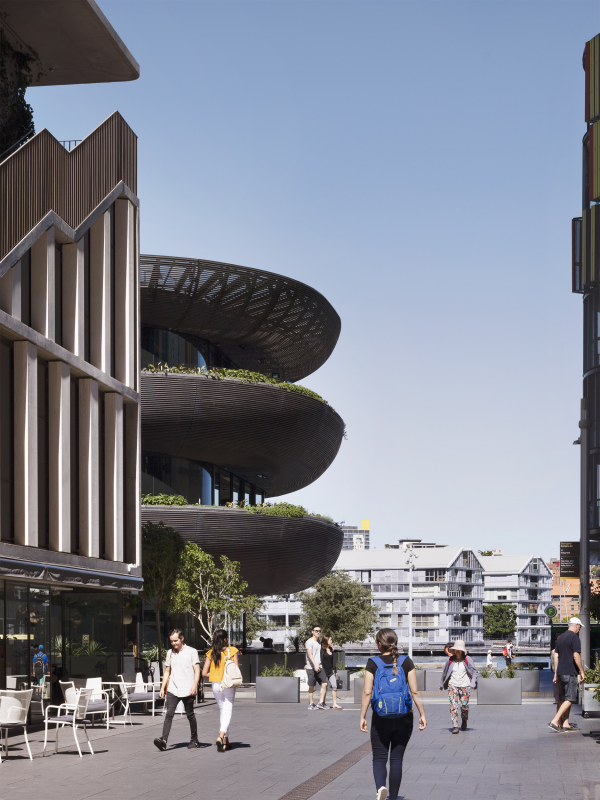 We think of Barangaroo House as being the result of an iterative series of examinations and prototypes, ultimately offering a highly unique response to the challenging requirements of its brief and design intent. From a technical perspective, the detail design and detailing of complex geometry isn’t an easy feat. 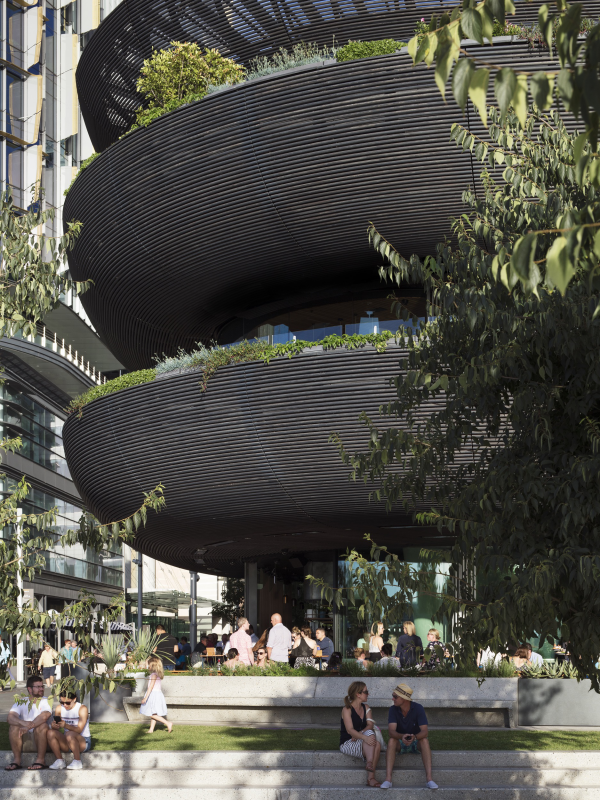 Steam-bent timber facades, continuous curved integrated planter boxes, slimline glazing systems with milimeter-precision tolerances, and cantilevering concrete waffle slabs are unforgiving, unlikely partners, and uncommon in Australian hospitality design. Testament to the unconventional premise underpinning many of the details, almost every aspect of the design went through a rigorous process of design development and testing. Prototypes to conceal dowel fixings, perfect the steam bending or charring texture of the timber, or test custom-laminated glazing products were subjects of frequent investigation, and informed key design decisions and selections. 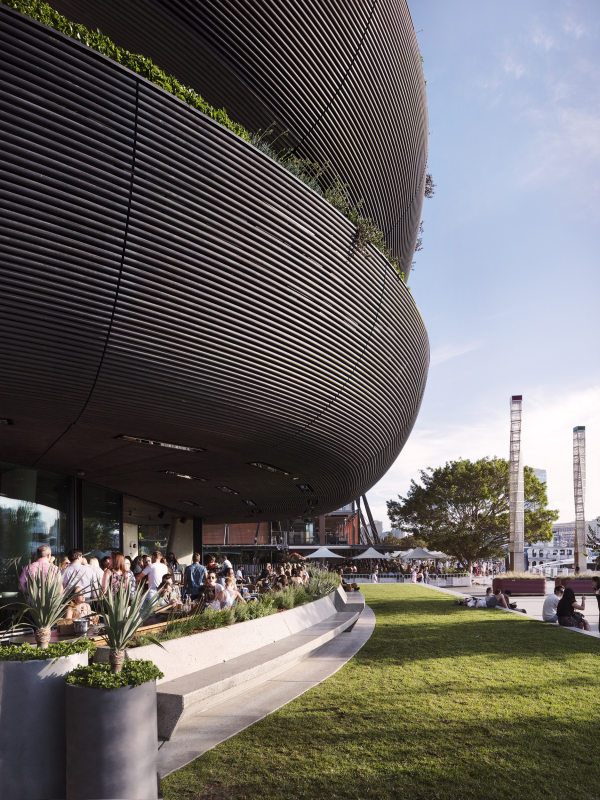 Planting is integrated in the form of the building through continuous planters to the circumference of each level, with the intention that edible plants are grown on site for use in the restaurant; minimising energy consumption, associated with food transport, in the operation of the restaurant. Deep articulation to facade terraces provide a passive means of solar control to all elevations. Glazing setbacks have been carefully determined to maximise occupant comfort and minimise solar gain on the facades.